Patio Umbrellas For Your Summer! an outdoor umbrella is just what your pool needs! How has your summer been going? The last couple of weeks have been very hot here in the Metro Detroit area and pool owners have been loving it. For some though, their perfect outdoor space is missing… a certain something. You want to enjoy the outdoors, but can’t handle being out in the blazing hot sun! There is a simple solution to this problem though: Get yourself an outdoor patio umbrella! There is a simple solution to this problem though: Get yourself an outdoor patio umbrella! You might be asking yourself “What are a few reasons to get an outdoor umbrella set?” and we have more than a few! We here at Sunny’s Pools and more have recently stocked up on umbrellas from Treasure Garden at our Macomb and Livonia locations! Check them out today! It’s amazing what a little bit of shade can do for you when the sun is blazing out. Shade can be a 10-15 degree difference between you being comfortable and cooked. Adding an umbrella to your pool area will make your summer days that much cooler! Giving your skin a break from the harsh rays of the sun is healthy. Skin cancer is a major concern for a lot of people, and getting out of the sun for even a little bit can help. Having family time outside makes for great memories. Getting your kids outside and in the elements is healthy for them, so why not pair it with a great family meal? 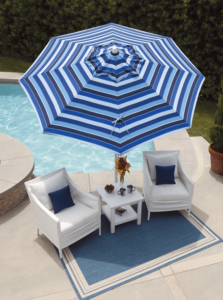 By giving your pool or patio set an umbrella you increase the outdoor lounge space. Not only do you have a cool shady spot, but you also create a new and usable space that would normally just… be there. If you want to add an umbrella or patio set to your pool or outdoor space Sunny’s Pools & More is here! Our Livonia and Macomb location are fully stocked with Treasure Garden Umbrellas. Check them out!